Some one hundred and nine proposals are currently ready for implementation in line with government’s agenda to build a factory in each of the 216 districts in the country, that’s according to President Akufo-Addo. 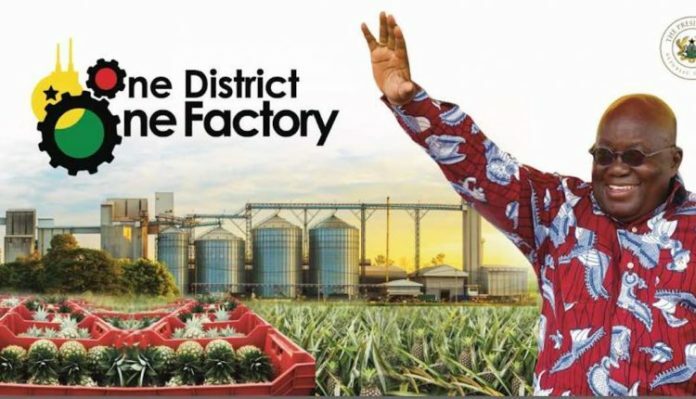 The One District, One Factory project is one of the major promises made by President Akufo-Addo’s camp during the 2016 electioneering campaign. The President announced the proposals when he addressed a durbar of Chiefs and People of the Kpone Katamanso Traditional Area. The durbar was held at the Kpone Methodist School Park as part of the President’s three-day tour of the Greater Accra Region. The President added that the motive of government in the 1D1F policy is to generate jobs for the youth. President Akufo-Addo earlier on his tour visited the Long Room of the Ghana Ports and Harbours Authority and the Ghana Revenue Authority to see for himself the Nature of work there. To that end, the President said the Paperless system introduced by his government contrary to complaints by some elements within the Ports and Harbours, is doing well and helping to transform the imports and Export sector of the economy.